SENT TO PRISON – Robert Linge, a 21-year-old timber feller from London Road, Brandon, appeared before magistrates, on April 5th, charged with assaulting Police Sergeant J.A. Adams. Mr Linge pleaded not guilty. His stepfather applied for an adjournment because his son had re-joined H.M. Forces and he wished his son to be properly defended, however the magistrates decided to continue to hear the case. Robert Lumsden, Headmaster of Brandon School, said that at about 9.45pm, on the evening of 27th March, a social event had been organised for the local Air Training Corps and Girls’ Training Corps. The entertainment was by invitation only. He said Mr Linge and a sailor friend tried to get into the room but Mr Lumsden prevented them because they had not been invited and in any case the sailor seemed to be drunk. Mr Linge then refused to leave and so he (Lumsden) gave the pair 3 minutes to leave or he would then call the Police. Police Sergeant Adams arrived and there was a scuffle where both Sgt Adams and Mr Linge fell to the ground. The Police Sergeant shouted for help and Mr Stanley Cator went off to summon some Military Police. When he got back it was over and Sgt Adams was sporting a cut that was bleeding. Police Sergeant Adams told the court that he had asked the two men to move on and the sailor replied, “Hello Matey!” The policeman then repeated his demand for them to go home and pushed Mr Linge. It was then that the scuffle broke out. Sgt Adams said he had attempted to use his torch in self-defence and did not actually hurt Mr Linge, although he himself did receive a broken nose. 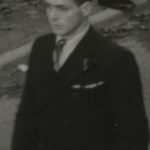 Special Constable Steggles said he accompanied Sgt Adams to the defendant’s home, 163 London Road, where Mr Linge was found with his mother and step-father. Mr Linge then accompanied both policemen to the Police Station where he was charged and detained. On March 29th he was brought before the Magistrates and remanded in custody. Mr Linge told the Bench that he and the sailor had both had a drink and then went to the A.T.C. dance but were not allowed in. They then walked down School Lane and stood on the corner. They had been there for about five minutes when someone came up with a torch and pushed them. His sailor friend replied with, “Mind what you are doing there Matey!” He was pushed again and then struck on the head with a torch and it was at this point that he struck back in self-defence, but did not know at the time that it was Sgt Adams. The defendant’s mother then gave evidence that her son was of good character. The Bench returned a verdict of guilty and Mr Linge was sentenced to prison for two months. His stepfather asked for leave to appeal and the Clerk, Mr George Carter, told him to see a solicitor. M.M. AWARDED TO BRANDON MAN – On December 11th 1944, Field Marshall Montgomery decorated Lance Corporal Robert Kimberly Linge, 1st Battalion, Suffolk Regiment, with the Military Medal for gallantry on the field. L-Cpl Linge’s parents live at 163 London Road. The following account has been taken from the book, ‘THE SUFFOLK REGIMENT 1928-1946’ by Colonel W. H. Nicholson. “Private R. K. Linge. Awarded Military Medal. On 18th October, 1944, Private Linge’s Company were engaged in cleaning the woods to the West of Venray. The enemy, approximately 500 strong, were established around cross-tracks in the centre of a wood with machine-guns and ‘bazookas’. The tanks supporting the operation were moving up one of the approaches when suddenly a bazooka opened fire on one of the tanks. 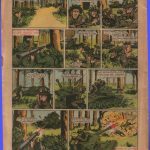 It’s position was located by Private Linge who, regardless of the fact that he was in full view and under heavy fire from the enemy machine-guns, immediately ran out into the open and clambered on to the turret of the tank. From this position he directed the fire of the tank on to the bazooka which was destroyed. Enemy machine-gun fire was being directed all the time at the tanks and at Private Linge himself. 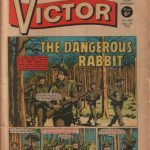 Bill’s story received some notoriety when it was featured on the front cover of a boys’ comic ‘The Victor’ on 5th September 1970. 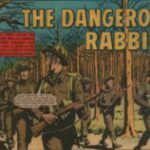 It was titled ‘The Dangerous Rabbit’ and detailed his story as a “poacher turned sniper” in a comic strip.